Chrichton's World: Review Banlieue 13 a.k.a. 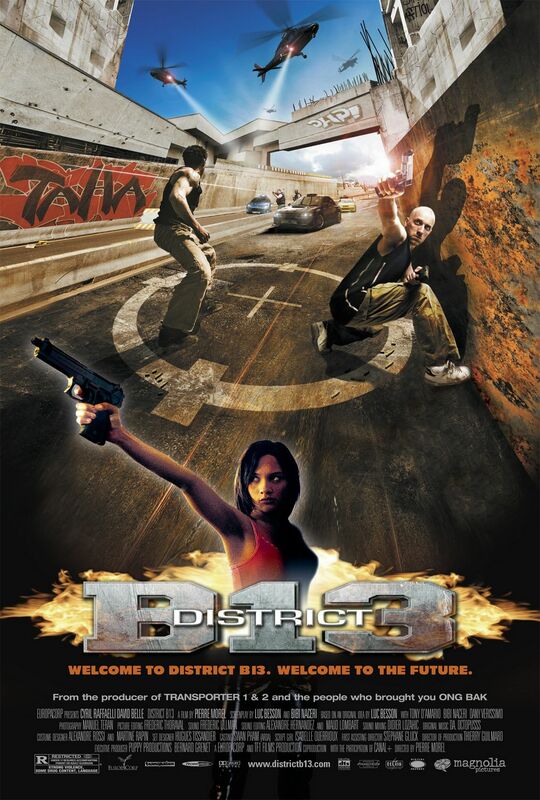 District B13 (2004): I can't believe I am going to say this but for once I wished there was a plot! Review Banlieue 13 a.k.a. District B13 (2004): I can't believe I am going to say this but for once I wished there was a plot! For me action films in general don't need that much of a plot. Just enough to get acquainted with the characters and have them move from event to event in service of the beautifully choreographed and hard kicking action. But what if despite this the action alone is not cutting it? This is the case with Banlieue 13. There is not enough memorable action to keep you glued to your seat. I am not going to lie. The first time I saw this I was pleasantly surprised by this thanks to the sheer insanity and the energy coming from this film. That and the amazing parkour scenes done by founder David Belle. But after having viewed this a second time I could not help but be disappointed by the fact that there is not that much parkour in this film. Most of the action consists of shootouts and martial arts which was nicely choreographed and performed by Cyril Raffaelli. However these action scenes aren't that long and plentiful. It could seem that way since the movie moves along in an extremely fast pace where the main characters are in constant motion thus giving the illusion there is a lot going on. If it is not the visuals you will get caught up by the cool and tight beats. All give a false sense of intensity while there is none. Strange how I did not notice this the first time. In my defense I did watch this around 12 years ago and back then movies like this were a rarity. But if you think about it Banlieue 13 is basically an old school Hong Kong action flick without the charm and fun factor those films had. If you never seen this film then you will be entertained while it lasts. For second time viewers it will be a disappointing affair. It only made me wish for something to be hooked on like a better plot or some comedic elements. Because this film takes itself far too seriously. Compared to Brick Mansions though this one is vastly superior. It does make you wonder though why they made that remake in the first place.